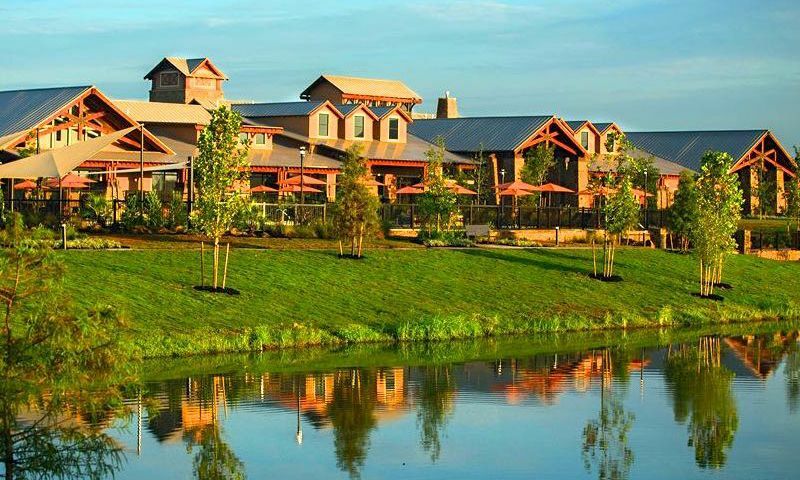 Sweetgrass is a Del Webb community for active adults aged 55 or better, situated on 500 acres southwest of Houston in Richmond, Texas. A natural creek, 50-acre lake, and four miles of walking trails are part of the pleasant scenery of this beautiful community. The area has express access to downtown Houston and major commerce, but is remote enough to allow for privacy. This Del Webb community opened in February of 2011. Upon completion, the community will have an estimated 1,500 homes. Del Webb offers 23 single-family floor plans designed with the active adult in mind. A 27,000 square-foot clubhouse filled with amenities allows homebuyers to stay physically and socially active. The Del Webb Sweetgrass state-of-the-art recreation center will embody the true meaning of southern comfort. With 27,000 square feet, The Lodge is the perfect place for residents to stay active and social with other residents. Homeowners will be able to play games in the billiards room or the card room or attend community events in the ballroom. The fully staffed clubhouse includes a fitness center with indoor lap pool. Residents will be able to enjoy a broad array of fitness programming that includes Pilates, yoga, and Zumba in the aerobics studio. The Lodge also provides homeowners with a Wellness Center, internet cafe, and a continuing education center for staying mentally active. The terrific amenities continue outdoors, where a variety of sports courts include tennis, pickleball, and bocce ball will keep neighbors physically fit. Residents will also have use of a resort-style outdoor pool, spa, and a pavilion area. Extensive nature areas and community walking trails wind throughout the community, allowing beautiful views of the scenic lakes throughout. This 55+ neighborhood also provides a boat launch, outdoor amphitheater for shows, and a firepit for a low-key night with friends. Del Webb started building the single-family homes at Sweetgrass in 2011 and will be complete with 1,500 residences. Home sizes range from 1,109 to 3,800 square feet. New buyers are able to choose from three series: Garden, Classic, and Estate. Each model is available with a choice of three exterior facades. The Garden Series homes have two or three bedrooms and one-and-a-half to three bathrooms. The Classic Series has two or three bedrooms with one-and-a-half to three bathrooms, while the Estate Series offers two or three bedrooms with one-and-a-half to three-and-a-half bathrooms. All models have two or two-and-a-half-car garages. Some homes come with optional second floors that can act as anything from an extra bedroom to additional storage space to an entertainment room. Floor plans combine the traditional and comfortable with innovation true to the Del Webb style. Premium lots, that offer water views or green space views, are available as well in Sweetgrass. Like all Del Webb communities, Sweetgrass is expected to offer an unparalleled lifestyle filled with exciting activities, clubs, and classes. While residents get to know each other in this developing community, the pioneers who first purchased are working closely with the on-site activities director to help shape an active calendar that caters to residents' desires for fun social activities. There are already dozens of clubs and events to choose from, ranging from interests in drama, gardening, investment, cards, or art. Residents will find an exciting array of health-related activities ranging from workouts in the fitness center to aerobics and water sports in the pool. Popular activities include book club, craft club, geneology club, yoga and much more. Whatever your mood, the clubhouse will entertain your whims and invite your arrival. Del Webb Sweetgrass in Richmond is situated near US 59, just beyond Sugar Land in Texas. It is right across the street from a shopping center that houses retail stores, banks, and convenience stores. Other popular stores nearby include Marshall's, Kohl's, Petco and Target. Sweetgrass is close to several medical facilities, including Oak Bend and Memorial Hermann. Within minutes, residents can find a movie theater, the local YMCA, the Fort Bend County Fair Grounds, and Brazos Bend State Park. Downtown Richmond and Sugar Land offer plenty of shopping, dining, and entertainment options. Sugar Land also hosts a variety of outdoor and indoor events throughout the year. Downtown Houston is about a half hour drive away and offers a busy city atmosphere with world-class shopping and dining as well as many opportunities for cultural enrichment. For more serene activities, the Gulf of Mexico offers anything from dinner cruises to deep sea fishing tours. Beach houses on the gulf coast make for perfect weekend getaways. Del Webb Sweetgrass is an exciting active adult community in Richmond, Texas. Lakehouse - 27,000 Sq. Ft. There are plenty of activities available in Del Webb Sweetgrass. Here is a sample of some of the clubs, activities and classes offered here. The Garden Series features seven floor plans that range in size from 1,109 to 1,475 square feet. They feature two to three bedrooms, one-and-a-half to three bathrooms and an attached two-car garage. The Classic Series features eight models that range in size from 1,628 to 1,928 square feet. Homes feature two to three bedrooms, one-and-a-half to three bathrooms and an attached two or two-and-a-half-car garage. Some homes also feature a den and extra garage space. The Estate Series features models that range from 2,184 to 2,587 square feet. Homes feature two to four bedrooms, two to four bathrooms and a two-car garage. Most homes feature gourmet kitchens with islands. Good location is the best thing Sweetgrass has to offer. Pulte is a shoddy builder.Hires cheapest workers they can find. Poor workmanship. Property Manager/Activities Director shows strong dislike for 55+ Active Adults. Treats residents like we're Assisted Living. I love this community so much that I am currently building a second home while my first one is up for sale, come look, it's beautiful! (we are moving closer to new friends we have met out here and for the husband to get his golf cart garage). I do not feel the homes are over-priced, you get what you pay for. And what you get is a community unlike any other, a small town feel where everyone waves, with a real sense of pride and camaraderie. Del Webb is an extremely unique and fun place to live and if you're bored, it's your own fault. Yes, the starting prices of homes are just that, starting prices. You must add lot premiums, structural upgrades, design center options, etc.... But living in Del Webb feels as those you are at a 5 star resort, year round!! We moved in about 18 months ago, and are very pleased with both the home and the community. The builder (Pulte) has been responsive to all of our service requests, Since the home is well built there have not been many. This is a community where you can be as deeply involved, or as distant as you wish. I'm still working full time, so I haven't availed myself of all of the social opportunities, but I'm looking forward to the time a few years from now when we can just join in all that Sweetgrass has to offer. We really like living here.. no regrets. Very over priced. We purchased a home here and with the upgrades which would be included, fencing. granite counters, anything but chrome fixtures with most builders. You will pay an average of $ 145.00 per square foot with Del Webb. You need to hire a outside building inspector we found many issues as told by other residences. The HOA is controlled by the PULTE Group not the owners. They do not advertise the $ 2000.00 one time fee for the homeowners association. They want you to use their mortgage company which you can get better rates and fees elsewhere, and by the way they do not pay for the title policy so go choose your own title company. We're currently building a brand new home here and are beyond excited to move in! After living in more of an urban environment for many years I am very excited to live in this gorgeous community! I could go on and on about how great everything is and we haven't even moved in yet! I can't wait to lounge by the pool next year and I know I will love the trails. We're looking forward to starting a new year in our new home, and to beginning a new chapter in life. 55places.com is not affiliated with the developer(s) or homeowners association of Del Webb Sweetgrass. The information you submit is distributed to a 55places.com Partner Agent, who is a licensed real estate agent. The information regarding Del Webb Sweetgrass has not been verified or approved by the developer or homeowners association. Please verify all information prior to purchasing. 55places.com is not responsible for any errors regarding the information displayed on this website.